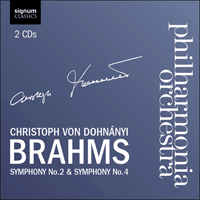 Christoph von Dohnányi and the Philharmonia Orchestra perform Brahms' Symphonies 2 & 4, the finale of the latter being widely considered one of the most exhilarating movements in the entire orchestral repertoire. It is little wonder that Brahms’ Second Symphony is often described as a sunny counterpart to, or a rainbow following, the storm clouds of his First. The previous November he had seen generally favourable reviews of the initial performances of the First Symphony, but more importantly, he had finally submitted a complete symphony for public presentation after some 15 years of doubt, disappointment, prevarication and interrupted effort. The pressure was momentarily off and he revelled in it, producing a second symphony in just four months. The Symphony No 2 in D major came quickly to life whilst Brahms was summering in the beautiful and restful village of Pörtschach on the Wörthersee, Carinthia. Despite his oft-present moodiness, his letters, and indeed the symphony itself, show him to have been in generally good spirits. Although Brahms was considered a rather snippy, often insensitive individual, he seems to have had a good deal of harmless, if mordant, fun teasing even his closest friends about the new, and as yet unheard, work. Writing to the publisher, Simrock, ‘The new symphony is so melancholy that you can’t stand it. I have never written anything so sad, so minor-ish: the score must appear with a black border’. To his close ally Elisabeth von Herzogenberg he mentioned that, ‘The orchestra will have to play with mourning bands on their arms’. Even his ultimate confidante Clara Schumann was left with the impression that the symphony was ‘quite elegiac in quality’. Of course, nothing could be further from the truth. When the composer’s friend Theodore Billroth played through the score he wrote to Brahms, ‘It is all rippling streams, blue sky, sunshine and cool green shadows’. And the Viennese audience at the first performance, on 30 December 1877 agreed—its idyllic nature, sheer tunefullness and generally sunny disposition earned Brahms an unmitigated public triumph, conductor Hans Richter having to repeat the third movement. The success was replicated in Leipzig soon thereafter, now with Brahms on the podium. Most pleasingly for the composer, his own native city of Hamburg, of which he harboured mixed emotions, also received the work generously. Just as Brahms’ First Symphony was known as ‘the Tenth’, so the second quickly picked up another Beethovenian sobriquet, ‘the Pastoral’—associations that seem to have been hated by the composer. Brahms, though, must have withheld a modicum of pride. After all, comparisons with a composer whose symphonic models had so intimidated him in the past, and of whom he had opined, ‘you have no idea how it feels to hear behind you the tramp of a giant’, can rarely be seen as wholly negative. The first movement, an Allegro non troppo opens with the cellos and double basses presenting a short motif that soon blossoms into broader themes both affecting and luxurious. There is a lot of sunlight in this movement; bucolic horn calls and soaring strings speak of blue skies and a joyous love of the countryside. There are certainly passages that lie in the shade and occasionally the threat of storm clouds in the distance, but such moments only throw into relief the sonorous strings and infectious dancing tunes. The Adagio is the longest slow movement in Brahms’ symphonic output and possibly the most beautiful, its romantic wistfulness touching rather than brooding. The Scherzo is a charming invention, an intermezzo crowned by its main theme which retains an awkwardly jolly, ländler-like feel. The Finale is a jubilant Allegro con spirito, contrasting the highest of spirits with a hymn-like tune in the strings. Its irresistible motion is capped by an extraordinary conclusion where the trombones lead us out in a blaze of glory. ‘I feel like I’ve just been beaten up by a pair of terribly intelligent people’ was the critic Eduard Hanslick’s comment upon first hearing Brahms and a friend play the composer’s fourth and final symphony on two pianos. Today such a comment would be considered a capital offence to most concert-goers the world over, such is the exalted position that the work continues to hold in the modern repertory. Many of Brahms’ friends and confidantes, though, agreed with the critic at the time, urging him variously to hold back the symphony from public consumption, dispense with certain details or even completely drop the Scherzo and Finale movements. Brahms stuck to his guns, refusing to change, and snapping back at the doubters, ‘I don’t give a damn about the shouters in the pit, and the rest of the public … You may be right. But first we have to hear how it works with orchestra’. The orchestra that Brahms used for his own first hearing of the piece, and indeed for its premiere, was the Meiningen Hofkapelle Orchestra. One of the finest ensembles of its day, its conductor, Hans von Bülow was close to many of the greatest composers of the age. He was a pupil of Clara Schumann’s father, and the husband of Liszt’s daughter, Cosima, who later ran off with Wagner. He was succeeded at Meiningen by one of his own protégés, Richard Strauss. The orchestra operated at the court, and behest, of Georg II, Duke of Saxe-Meiningen, a remarkable intellectual whose theatrical productions so seriously influenced European theatre that he is often known as the first modern theatre director. The Duke not only kept Brahms in the lap of luxury when he visited, but allowed him to use the orchestra as a musical laboratory for his works, and thus it became, for a time, the arbiter of how Brahms’ works might best be performed. The symphony’s premiere, on 25 October 1885 was avidly applauded after every movement and met with an ecstatic ovation at its end. Brahms was now happy for von Bülow to ‘travel around a bit with it’, and so a tour of 14 cities was arranged. The important Vienna premiere didn’t occur until the following January and the symphony was met with healthy respect rather than ecstasy. Brahms hadn’t changed his symphony, but already Hanslick was changing his tune: from being ‘beaten up’ by the piece, he now found it to be, ‘like a dark well; the longer we look into it, the more brightly the stars shine back’. The Viennese also came round, notably on 7 March 1897. The last applause Brahms heard for a symphony was for his own fourth, one month before his death, at a concert in the Golden Hall of the Musikverein, where he and his swansong symphony were greeted with tumultuous applause. The opening Allegro non troppo dispenses with introductory niceties; a four note theme seeming to come out of nowhere, as if the symphony was already in mid-flow, sighing violins taking us straight to the heart of the matter. The ensuing orchestral argument is one of Brahms’ most miraculous, marrying intense lyricism with a strong sense of purpose, an urgency to continue the musical discourse. The Andante moderato slow movement sees the opening horn call caressed throughout the orchestra, gently mutated, coloured and even augmented on the cellos to produce what passes for a subsidiary theme. The Scherzo is full of the most unexpected comic turns, Brahms boasting that ‘kettledrum, triangle and piccolo will … make something of a show’. In the magnificent, immense Finale Brahms uses a Baroque device, the passacaglia, essentially a set of continuous variations over a short, repeated bass line. This is allowed to pass throughout the orchestra, setting the composer free to provide a summation of his art and at the same time entertain with one of the most exhilarating movements in the entire orchestral repertoire.